Sackets Harbor, NY - If you have always wanted to try hand-tying a quilt, now is your opportunity with some of the North Country&apos;s finest quilters on Sunday, May 24th from 11 am to 4 pm at the Great Lakes Seaway Trail Discovery Center in Sackets Harbor, NY. The ladies of the Mennonite Heritage Association, Croghan, NY, serving as docents for the special "Passing on the Comfort: World War II, Quilts & the Women Who Made a Difference" exhibit at the Great Lakes Seaway Trail Discovery Center will show you how to tie a handmade quilt. The ladies are working amidst the "Passing on the Comfort" quilts - a rare collection of quilts and comforters used by children, Jewish fugitives, Nazi Resistance workers, and Mennonite refugees fleeing the post-war Soviet Union and given shelter by a Mennonite couple in the Netherlands. This special exhibit is open Fridays, Saturdays and Sundays now through June 28 at the Great Lakes Seaway Trail Discovery Center. The professionally designed interpretive and interactive exhibit includes the quilts and comforters, interpretive panels of historic WWII-era scenes, and a DVD sharing the story of An and Herman Keuning-Tichelaar who sheltered people in their parsonage. The quilt that the Mennonite Heritage Association ladies are working on at the Great Lakes Seaway Trail Discovery Center is a modern-day example of a relief quilt that will be passed on to someone in need in the region or anywhere in the world. Quilting is a popular travel theme for the 518-mile-long byway that parallels the St. Lawrence River, Lake Ontario, Niagara River and Lake Erie in New York and Pennsylvania. A 22-mile loop tour off the Great Lakes Seaway Trail in Orleans County, NY, features a cell phone tour to more than 40 traditional quilt block patterns painted on barns. The New York Council for the Humanities, Mennonite Heritage Association, Seaway Trail Foundation, Town of Hounsfield, National Grid and Key Bank are sponsoring the "Passing on the Comfort" exhibit. 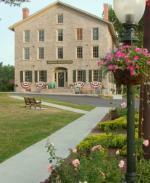 The Great Lakes Seaway Trail Discovery Center is located at Ray and West Main Streets in Sackets Harbor and is open 10am to 5pm. Learn more online at www.seawaytrail.com or call 315-646-1000.